With space becoming a premium cost to living, especially in cities with dense urban populations, finding creative ways to open up your home and provide a greater sense of freedom can help keep you feeling stress-free and happy. 1. Use bright paints and colours in your kitchen. 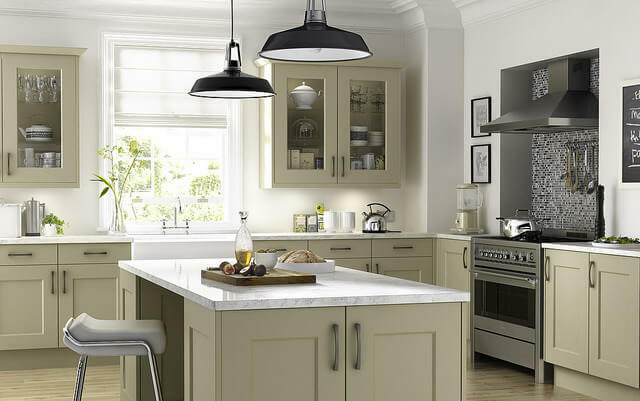 Paints such as white or light blue, green, or yellow, to allow more light to reflect around your kitchen and prevent dark areas that can become lost to the eye. If you do paint the kitchen walls, consider painting the cabinets in bright colors and choose a kitchen countertop and backsplash that is also bright, eliminating high contrasting colors that tend to accentuate a small area rather than open it up. Bright paint will also diffuse natural and artificial light better, brightening and opening up the kitchen even more. Possibly consider using a quartz backsplash in your kitchen, as quartz comes in an array of beautiful light colours and patterns, is incredibly durable in comparison to marble or tile, and a lot easier to clean! 2. Bring in natural light. Having large and many windows in the kitchen, and then ensuring you use bright window shades that allow natural light to pass through, will help brighten the kitchen and open it up, hiding shadows that shrink the room and bringing in some extra vitamin D for those early morning starts. Natural light is a great way to remain stress-free and will work hand-in-hand with bright colors. 3. Use smaller furnishings with open frames. Having large islands, wide dining tables, or solid-backed chairs can block your view of all corners of the kitchen and quickly shrink the available space. Using smaller tables, chairs with open legs and an open backs, as well as islands with no sides, will allow you to better see through them and create more depth to the kitchen. You could even get some gas lift bar stools to hide under your island when you’re not using them, meaning they will be completely out of the way. Out of sight, out of mind. Think minimalism in this area, and you will find all the missing space you forgot you had. 4. Use horizontal shapes on the floor, and vertical on the walls. If you fancy a little more character in your kitchen, use vertical lines on the walls, or horizontal lines the floor; this will appear to widen and heighten your kitchen. Lines draw the eye from one side of the room to the other, creating a sense of depth. Horizontal lines, diagonal lines, diamonds, and zig-zags on your kitchen floor are all shapes that provide this effect. Straight vertical lines using wood panelling or alternating, low-contrast, paint on the walls wills draw the eye upwards to the ceiling, bringing a sense of height. Keep the lines skinny, rather than wide, to increase this effect on walls, whereas the opposite is true for the floor. My friend decided to create a horizontal focal point in the room with her faucet and best kitchen faucets for 2019 served as inspiration for this. Many kitchens have space between their cabinets and the ceiling. Adding some crown molding top the edges of the ceiling or on top of cabinets will draw the eye upwards to the details. Neatly storing room affects such as storage baskets, artwork, large serving ware, or pantry items such as olive oil or grains in clear containers, are all great ways to clear out clutter on kitchen countertops and draw the eyes upwards. 6. Have clean and solid lines and shapes. Installing a seamless kitchen countertop, such as granite, marble, or quartz, will significantly help a kitchen feel less cluttered and cramped, and can act as an anchor to the room. This will allow you to organize your kitchen appliances anywhere on the surface without causing distracting breaks in lines or patterns from countertops made from multiple cut pieces. Breaking lines can create more contrast and therefore a messy looking kitchen which will appear much smaller. More on quartz and granite countertops here. Consider coming into the showroom at K&J’s Custom Granite in Edmonton to take a look at their wide selection of granite, marble, or quartz countertops for your kitchen and speak with one of their interior designers! Whether you are remodeling, designing, or just cleaning up your kitchen, follow these tips to bring the most out of your kitchens available space.